Oscillating between California in 2008 and Warsaw, Poland during WWII, Deborah Gaal expertly weaves together the stories of Maude Fields and Goldye Finkelstein. Maude Fields is a widow in her seventh decade and about to become a grandmother. She’s also on the verge of losing her house due to exorbitant medical bills. To conserve costs and save her home, Maude moves her estranged mother, Bea, from the nursing facility to her house. Along with Bea comes a 14-foot tapestry, a story montage of the Battle of Hastings. The tapestry harbors many mysteries, not least of which is Bea’s skill; Maude never knew Bea to sew, but somehow she meticulously recreated the Bayeux Tapestry. 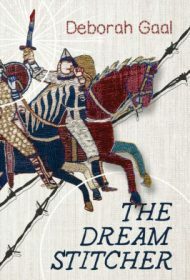 The Dream Stitcher is an epic tale, perfectly blending history, mystery and fantasy, and delivering characters rich in dimension and intrigue. Readers will empathize with Maude’s financial dilemma, brought on by an over-compassionate personality, and identify with the complex relationships between Maude, her mother and her adult daughter—all living under the same roof. The magic sprinkled into Goldye’s character is just right as she sparks optimism in those around her, as well as in readers. Die-hard mystery fans may find the initial pace a little slow, but absorbing the detailed set-up is amply rewarded with a vibrant, suspenseful and satisfying reading experience—one that skillfully illuminates the strength and resilience in women.